Audi R15 plus TDI team No9 driven by Mike Rockenfeller of Germany leads the race after 350 laps during the 78th 24 hours Le Mans endurance race, in Le Mans, western France, Sunday, June 13, 2010. Immortalized by Steve McQueen in his film Le Mans, this event is composed of cars driving as fast as they can for 24 hours straight (with obvious pit stops to fuel, etc.). Founded in May 1923, this race  run over both a circuit and local roads closed for the event  tests both speeds (these cars go fast) and endurance. The drivers usually last longer than the spectators. 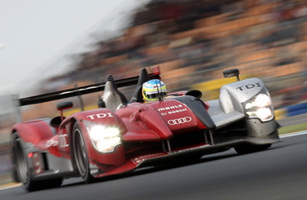 This year's race was run June 12-13, and carmaker Audi took the top three spots, winning its ninth Le Mans race.